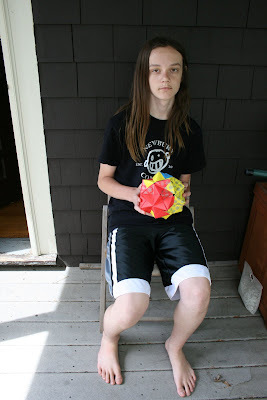 Ben shows me his stellated icosahedron on the back porch - pictured. A icosahedron is any polyhedron having 20 faces while stellated refers to "stars"; Ben has prepared his by hand using origami paper. He intends to make 50 of these formations and a floating-mobile. Ben is an exceptional kid who is educated at the Sudbury Valley School, which I saw on '60 Minutes' ten years ago for its unique approach to education. Ben and his mates arrive on site any time between 8AM and noon where they must spend at least five hours doing .. whatever they wish. There is otherwise no structure nor grades and to attend, one must spend a week determining "a fit." I observe children from four or five to 19 cooking, doing art and playing Dungeons and Dragons or reading on a lumpy pillow bed beneath enormous windows .. they can play video games or watch movies, surf the Internet .. whatever strikes their fancy. The grounds are immaculate, located in the Massachusetts countryside. It is, no doubt, an alternative approach to learning and for Ben it makes a lot of sense as it allows him to explore his genius without worrying about a syllabus, national testing and the ever present thumb-on-forehead which is our national school system whose quality, sadly, has deteriorated along with many things US these past eight years (or more). I wonder if Sudbury kids go to college - and it appears most do not. Following five years, they receive a 360-degree evaluation from colleagues and adults who determine a readiness to enter society (without grades or other forms of standard review, I am not sure what a college application would look like). Sudbury could not be more different from my Berkeley education and London for Eitan and Madeleine - while I and my kids seem to thrive in a structured and organised environment, I fully appreciate that others thrive in just the opposite. I give Ben a dollar for this picture.